Earlier this week we looked at how to solve the “string mop” problem by using big brushes, keeping the masses simple, and softening edges. It also helps to visualize masses of hair as ribbons. 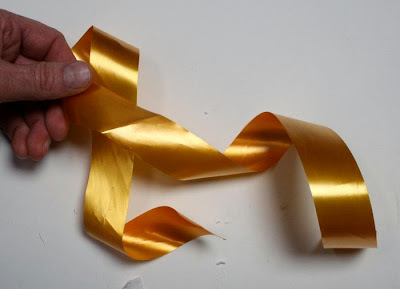 In a real ribbon, the highlight goes across, not along, the curving shapes. 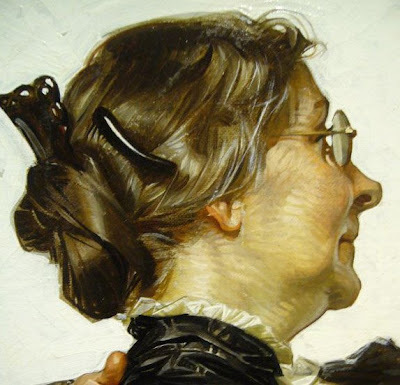 Leyendecker often captured this ribbonlike quality when he painted hair. Note the lock of hair at the righthand edge of this woman’s bun. The cool highlight crosses the lock, with the warm-toned highlight beside it. When hair is short or pinned close to the head, the highlight extends across a large region of the entire head, with the full mass of hair getting darker as it turns away from the highlight region. 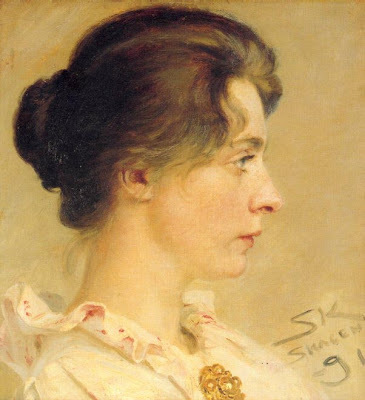 Kroyer paints the lighter brown tones where the hair catches the frontal light, and lets the whole back of the head go to an uninterrupted dark. The same is true with Leyendecker. 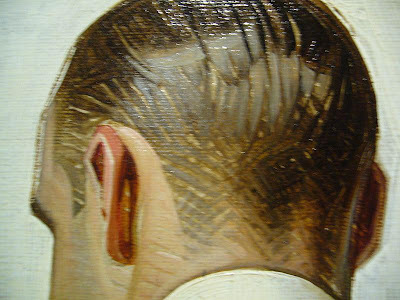 Even though he weaves those strokes like a basket, he never loses sight of the big arrangement of light tones, linking individual locks into a single light mass across the whole head. 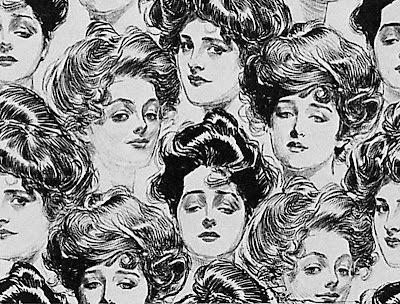 Drew reminded me about pen and ink techniques, so here are some coiffures by Charles Dana Gibson that show all the same principles we’ve been talking about, but in a totally different medium. 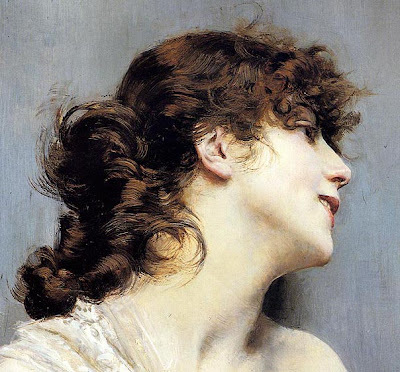 Even if you want to suggest a lot of detail, as Boldini does here: use a big brush, merge locks into larger waves, paint the highlights across those wavy forms, and aim for the ribbon instead of the mop. Part 1 "Hair: The String Mop" link. Thanks, Steve and Augie for the Leyendeckers. To see the full Leyendecker photo set on Flickr, link. Mr. Gurney, another delightful read. I always forget that bit about highlights going across instead of along the length of the hair mass, which has lead to many drawings and ink sketches to have people ended up with silhouette hair shapes or no shadow rendering. Although the ribbon technique works really well for long-haired folk, what about if you're drawing a person with short hair? I imagine there wouldn't be as many clear masses, so if you were to apply this technique, it may look as if the character was wearing some kind of bizarre hair cap. Would the highlights be broken up across the plane of the head? Yes, the ribbon idea mainly works with longer locks. With a butch cut--or for that matter with animal fur——the rules change. That's what makes hair such a challenge. Thanks for adding in the pen and ink section, too! I just discovered your blog through a link in another blog, and I'm so glad I did! Thank you for that link to Leyendecker closeups!!! It is such a great source of reference and inspiration. Mr. Gurney, I was about to post a link to my flicker account with more JCL photo ref, but imagine my surprise when the link was already on your post. That was an amazing show and I hope it gets to tour around to more cities. You've made me look at head highlights a whole different way. I appreciate all the time and information you put into your posts and look forward to them daily. Now, if you'll excuse me, I need to repaint all my current head highlights. Wow James!....great post. These will help me turn hair into something both exciting and beautiful, instead of the dull, flat and ugly monstrosity I usually end up with. Thank you. Thanks for this very useful information, Mr. Gurney (or is just James okay?)! I happen to be currently painting a head of hair, and these tips about highlights and edges have already proven very useful. Double thanks for that link of closeups! 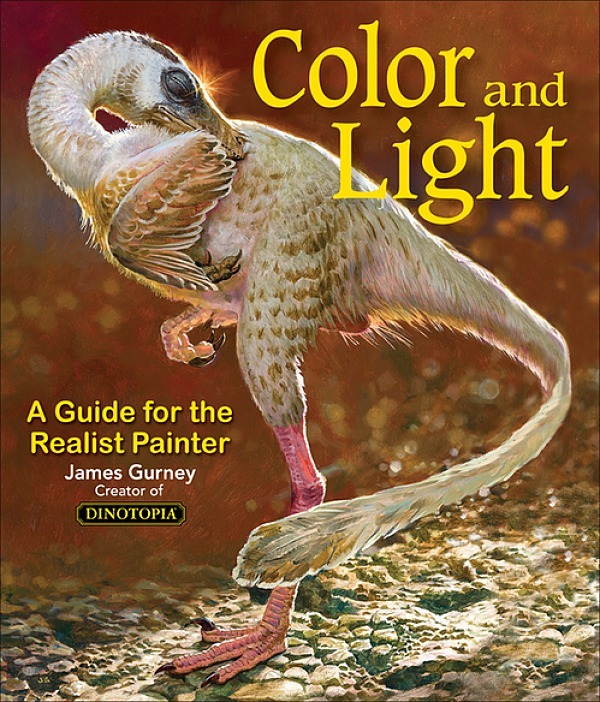 Those are some fine colors and brushstrokes to study. All this information on how to do hair is timely for me! I'm working on a piece where the hair is such an important part of the composition. I'm going back to read over and study all you've had to say before I get going on my drawing today. Hair is always a challenge for me, so you're post is very welcome. I tend to spend more time on hair, especially the short curly type, than even the face. Finding your blog and all of its' generous and well displayed information is a gift to all of your readers and followers. Showing specific examples de-mystifies so many challenges that all of us face at one time or another. I'm now considering myself a student of the University of Gurney and thank you heartily for taking the time you do to illustrate your points so clearly and fully. Another great post... thanks esp. for the Leyendecker close-ups. Are those from a show? And thanks for another great lecture. Hopefully, we'll cross paths at the NY Comic Con. Moai, yes, "James" is fine...no need to "Mr. Gurney" me! Enzie, I just discovered your wonderful Orientalist Gallery blog. 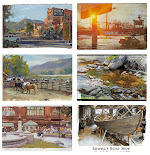 What a goldmine for finding out about these great painters. Paolo, Yes, we have Augie to thank for those great Leyendecker shots, which were forwarded to me courtesy of Acad of Art prof Steve Kloepfer. And to Anima, Gail, and Jared: Hair is a challenge for me, too....in more ways than one! Although the ribbon technique works really well for long-haired folk, what about if you're drawing a person with short hair? I imagine there wouldn't be as many clear masses, so if you were to apply this technique. what a dummy Term paper just copied the text of Drew and pasted it again. Lanthanum, That's observant of you to notice this new spam strategy. I don't get around to removing all the spam (and I'll leave this one up so people know what we're talking about). But it's safe to say that if a comment has links for tennis shoes or term papers, it probably has nothing to do with this blog.